Remakes don’t always light up the box office, but how good is this version of the 1976 classic? High school bully victim, Carrie, realises she can move things with her mind; however, it’s only when she’s pushed to her limits that she really needs to use her unique powers. One of the stand out features of this 2013 remake is Chloe Grace Moretz’ take on Carrie as a character; she carries the role much more awkwardly and hesitantly, which is perfect for the high school recluse’s characteristics. Further more, the character’s transformation is seamless from her isolated and solitary beginning to prom queen, allowing Moretz to portray both versions of Carrie comfortably. Visually, Moretz again fits the bill, which is likely down to her naturally youthful look; it also massively helps that the lead now actually looks like a teenager, rather than twenty-seven year old Sissy Spacek who played the original film’s Carrie. Unfortunately, one of the film’s major downfalls is that too much of the story feels identically copied and played out from the original. This is expected to a degree, but when compared to other remakes, like the 2013 version of Evil Dead, 2013′s Carrie never manages to add anything new to the horror classic. At some points the dialogue even seems to be the same, line-for-line, as the original, which isn’t something that is ever likely to create a compelling new film. The majority of the film’s horror aspects are held off until the final few scenes, where the floodgates finally open after prolonged and patient intensity. 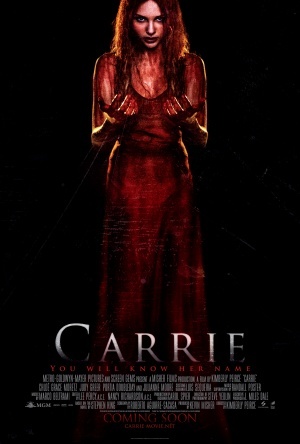 These horror scenes use a modern twist, impressively allowing Carrie to show off her mind powers with more contemporary CGI and film making techniques, freshening up what could have been more of the same. This 2013 remake does the original film justice; but despite the more interesting lead, the film unfortunately uses too many identical elements of the original Carrie and never really gains its own identity.